Hawaii is synonymous with beaches. If you go by guidebooks, finding a beach with no crowd is a challenge :) There are places which are beautiful and not crowded. The key is- avoid the beaches that are mentioned in the guidebooks or recommended on internet. 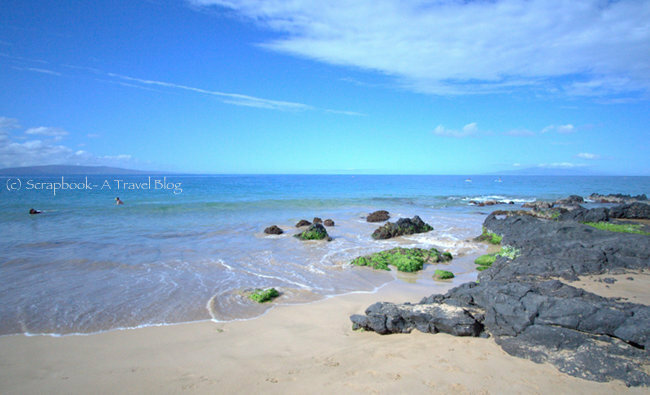 When I was in Maui, I stayed near Charley Young Beach which was fairly crowded. As the sun started sinking down the horizon hardly anybody there on the beach. An evening walk along the beach was refreshing. This was just amazing blue ,Kusum! A gorgeous beach and photo! I loved Maui and Hawaii! Have a happy weekend, Kusum! Stunning!I wish I could be there too!Have a nice weekend. Stunning & fascinating blue sky and beach ! Brilliant image ! Seems like a beautiful quiet beach to me. Sure can't beat this beautiful location!! It's all in the timing isn't it? Gorgeous. This is the way I like beaches. Oregon has them , except of course they can be cold. Florida, where we spend the winter, it is very hard to find a quiet beach! Yeah, I have seen pictures of Oregon beaches but never happened to see any. They look beautiful but as you say they can be cold! Guidebooks as a double-edged sword. They point you to some very good places - but it not only you that they point! How I'd love an evening walk along the beach! Such a beautiful scenic location.